This story was updated at 3:45 p.m. This evening's rush hour could have been a lot worse. The High Five interchange in northern Dallas — U.S. Highway 75 and Interstate 635 — was shut down for most of the day Thursday after a tanker truck rolled on its side and spilled hazardous materials. It took hours for crews to clean up the mess. As of 3 p.m. all lanes of 75 and 635 were reopened, save for the ramp from southbound 75 to eastbound 635, where the accident occurred around 4:15 this morning. Central Expressway will be shut down in both directions in parts of Plano and Richardson this weekend, starting early Saturday morning. U.S. Highway 75 between Renner Road in Richardson and 15th Street in Plano will be closed so crews can remove the remaining portion of the Plano Parkway overpass. Not news: Traffic in Dallas is more or less awful. News: Dallas drivers didn't sit in it for quite as long last year. In North Texas, no place is booming like Plano. As sparkling new residential and retail hubs continue to sprout, companies like Toyota plan to bring in 15,000 new employees over the next year. That’s a big business opportunity – and a big headache when it comes to moving all of those people around town. Five stories that have North Texas talking: Dallas traffic costs drivers time and money; Texas Monthly will still cover politics, editor clarifies; check out the horns on this steer; and more. "Comply, then complain" and similar phrases could become all too familiar to Texas' newest drivers, as lawmakers work this week to push two solutions to the rift between law enforcement officers and the communities they serve. Can Dallas Drivers Survive A 12-Hour Shutdown Of I-35E This Weekend? Every southbound lane of I-35E is closing through downtown Dallas, starting Friday at 10 p.m. But relax: The shutdown's only supposed to last 12 hours. Five stories that have North Texas talking: The new ramp is a part of the ongoing TxDOT Horseshoe Project; award-winning sportswriter Blackie Sherrod leaves his legacy in writing; listen to an exclusive interview with Diane Rehm on Think; and more. If you drive around North Texas, you’re often stuck in traffic. Go around the state and it’s even worse. Austin drivers who complain about Interstate Highway 35 have been validated. 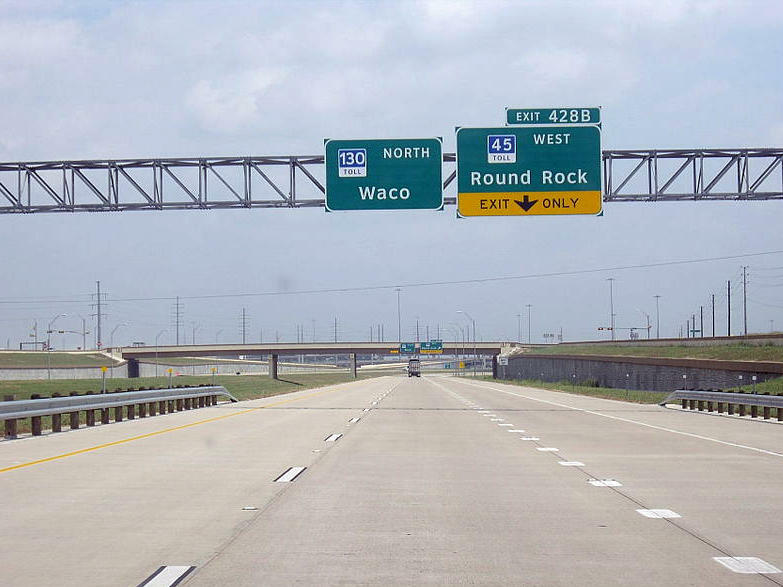 A new report from the Texas A&M Transportation Institute named the stretch of I-35 between U.S. 290 N and SH 71 as the most congested roadway in Texas. The share of Hispanics receiving traffic citations from state police has doubled in the last five years, even as the total number of tickets written and total number issued to whites have dropped significantly, according to Texas Department of Public Safety data on non-commercial drivers. More than 11,000 residents in Arlington have signed a petition to remove the city's red light cameras. The City Council voted Tuesday to put the issue on the May ballot. But a Republican state House member from Bedford wants to go a step further. State Rep. Jonathan Stickland filed a bill for a statewide ban on red light cameras -- and he sat down with KERA to talk about why he wants to eliminate the cameras. Five stories that have North Texas talking: more details on Tuesday’s strange traffic scene on LBJ; Big Hoss has its big debut; a Northeast Texas woman has given birth to quintuplets; and more. Guess Where The Worst Traffic Spots Are In Dallas? Five stories that have North Texas talking: Worst traffic spots in Texas listed in new study; $400,000 worth of sorority pins stolen in inside job; Texas Revolution is center of upcoming History Channel series; and more. The express lanes on Interstate 30 between Arlington and Dallas closed today. It will take two years to rebuild them as "managed toll lanes." How Does Your Commute Stack Up To The Worst In The U.S.? It's tough out there for commuters. If you have not paid that traffic ticket or minor citation, now may be the best time to take care of it. North Texas police are getting ready to arrest you. Our own Bruce Gunn gets his moment in the sun in D magazine's latest issue -- thanks to an amazing streak: The man didn't wear pants for 1,494 consecutive days. Interstate 10 has reopened near Beaumont after a 100-vehicle Thanksgiving-morning wreck that killed two and sent more than 50 people to the hospital. Police blamed fog. Five stories that have North Texas talking: Celebrating Thanksgiving's eve animal-style, the magic of lip dubs and more. Think the mall parking lots are going to be a zoo on Friday? Just check out the real thing today. It’s Dollar Day at the Dallas Zoo. Admission for everyone is $1. And that means a stampede of kids out of school, relatives in town for Thanksgiving and minivans trying to get off I-35E at the Marsalis exit. It’s “Spring Break” this week for most North Texas public schools and universities, but fewer students and families are planning out-of-town road trips. KERA’s BJ Austin says they’re sticking to the local freeways and attractions closer to home.